Since my trip to Paris earlier this year, I’m big on French wines. I’m not a wine snob by any means, but I am fine tuning which ones I like and which ones I don’t. 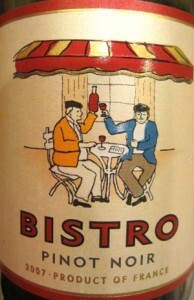 The Bistro 2007 Pinot is very tasty and enjoyable. The fine lady and I had a great evening of food and wine, featured by this nice Pinot.